Medically supervised and based on extensive clinical research, JumpstartMD offers nutritional science and 1-on-1 support that changes lives. At the Obesity Week 2018 Conference, Dr. Sean Bourke, JumpstartMD’s Chief Medical Officer and Founder, presented compelling new research that showed that the average weight loss in JumpstartMD patients was greater than published reports for other commercial programs. This included commercial program that count calories (Weight Watchers, Slimming World, Rosemary Conley), provide prepackaged meals (Jenny Craig), and use meal replacement (Nutrisystem). The analyses were based on 22,407 JumpstartMD patients between 2007 and 2017. JumpstartMD’s customized weight loss curriculum emphasizes a low carbohydrate lifestyle using fresh, whole non-packaged foods, structured meal plans, private one-on-one coaching, and medical supervision by licensed clinicians. Optional FDA approved anti-obesity medications are available for qualified patients. JumpstartMD patients who attended at least 75% of their weekly appointments lost an average of 21 pounds at three months, 30 pounds at six months, and 35 pounds at nine months. The same group lost 10.2% body weight and 3.33 kg/m2 BMI points at 3 months and 14.2% body weight and 4.89 kg/ m2 BMI points at 6 months. Individual results varied, with heavier patients losing more weight (1). 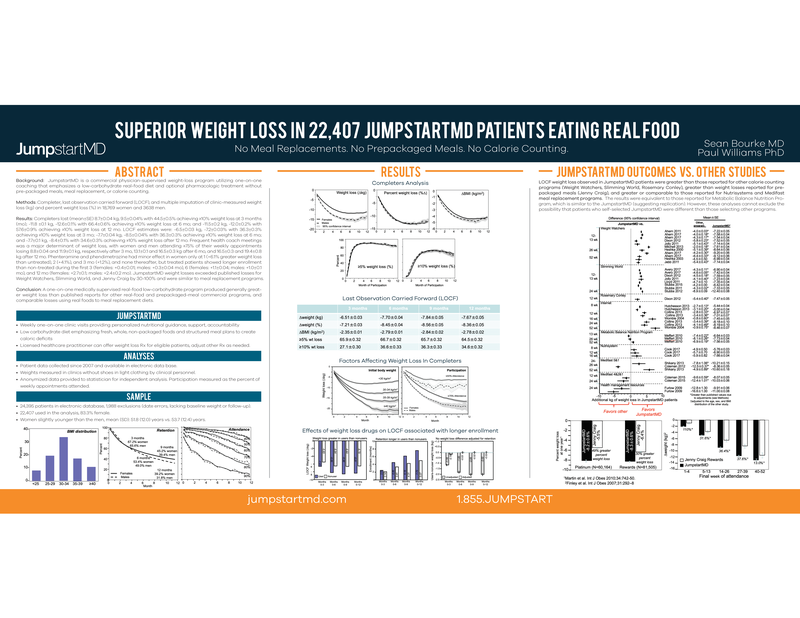 JumpstartMD’s outcome vs. other published studies: Based on 19 scientific papers published since 2000, JumpstartMD patients lose an average of 86% more weight than reported for Weight Watchers participants at 3 months. Similarly, JumpstartMD patients lost nearly 3 times more weight than published results for Weight Watchers at 6 months. Bourke also compared JumpstartMD to published studies on Jenny Craig, a program providing pre-packaged meals. JumpstartMD weight loss results were 49% better at 3 months and 30% better at 6 months than reported for eighty-one thousand Jenny Craig patients(2). Bourke found fewer studies on Nutrisystem, a program that provides high protein shakes and other meal replacements. The biggest study (3)., which never made it into a scientific journal but was presented at a conference, stated that 103,693 website enrollees claimed 18.2 average pounds lost at 3 months and 27.2 pounds lost at 6 months. Corresponding JumpstartMD patients had lost 18% more weight at 3 months and 9% more weight at 6 months. About JumpstartMD: JumpstartMD is a medical practice dedicated to pre-emptive medicine through lifestyle changes and healthy sustainable weight loss. Personalized program based on proven nutritional science, one-on-one lifestyle counseling and real, fresh food. Founded by Stanford trained physicians and board certified Diplomates of the American Board of Obesity Medicine. PPO, HSA and FSA reimbursement support provided to patients. More at jumpstartmd.com or (855) JUMPSTART. Take your first step towards improving your health and wellness today and connect with a JumpstartMD Program Specialist.